I love to walk on crisp fall days and see all the leaves scattered on the ground. 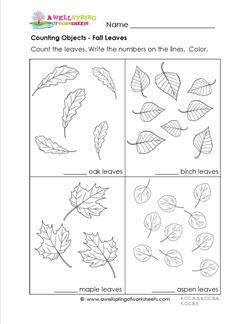 You'll find oak, birch, aspen, and maple leaves scattered on this counting objects page. 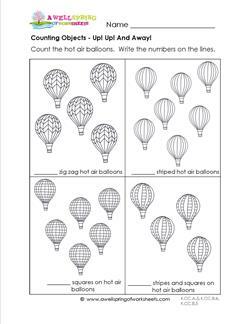 Let's count objects that will take us to the great outdoors! Ready to go camping? 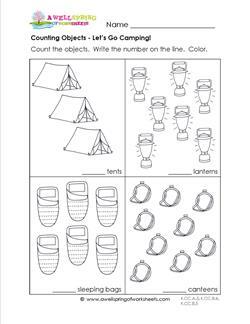 Count the sleeping bags, tents, canteens & lanterns. 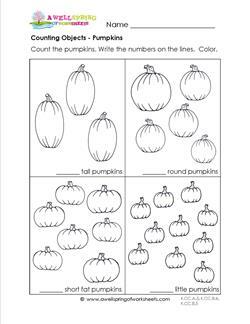 In this counting objects worksheet you get to count pumpkins of all shapes and sizes - short and fat, tall, round and those cute little pumpkins. You've found some out of this world objects to count here. 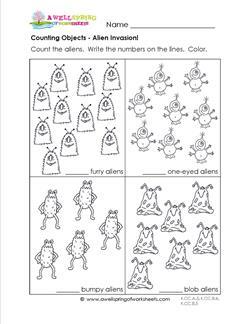 Count the furry aliens, one-eyed aliens, bumpy aliens, and blob aliens. 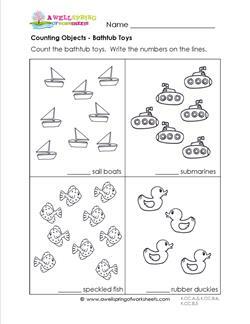 Write the numbers. 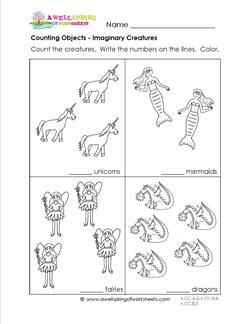 As you count the imaginary objects on this page let your mind think of Tinkerbell, Ariel, Puff, and ... I don't know a famous unicorn. 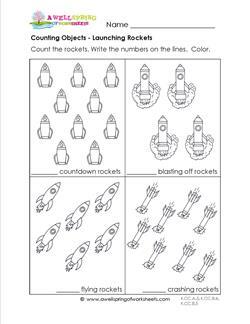 Here's some counting objects fun: Count and make the sounds of the countdown, blast-off , flying, and crashing rockets. It's a beautiful day for a picnic! 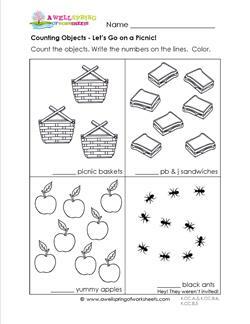 Practice counting objects by counting the picnic baskets, sandwiches, apples and ... ants?